This dressing can also be made as a delicious veggie dip, simply omit the milk/olive oil. 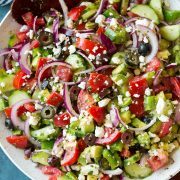 If you are looking for an easier dressing you could use this recipe here and just add milk (and a little olive oil if desired) to thin. 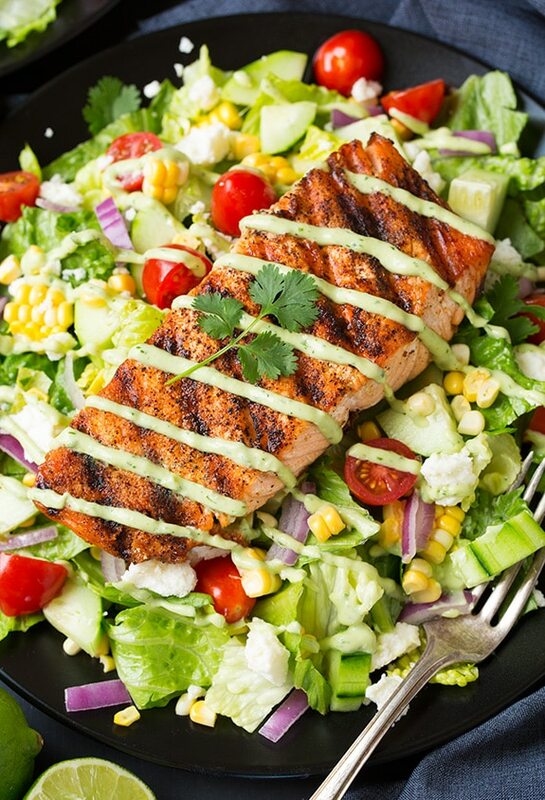 You are going to love the way this Avocado Greek Yogurt Ranch Dressing pairs with this seasoned and grilled salmon! If you don’t want to do the extra work of getting all the ingredients for the salad you could just eat it as salmon with the dressing then have some sort of rice or something as a side. Or you could have it in tacos, I’m always game for tacos. 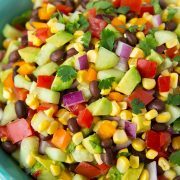 The salad is a great way though to get a generous serving of veggies in your diet plus it’s perfect for summer! And once you try this healthy avocado dressing you’ll be hooked! 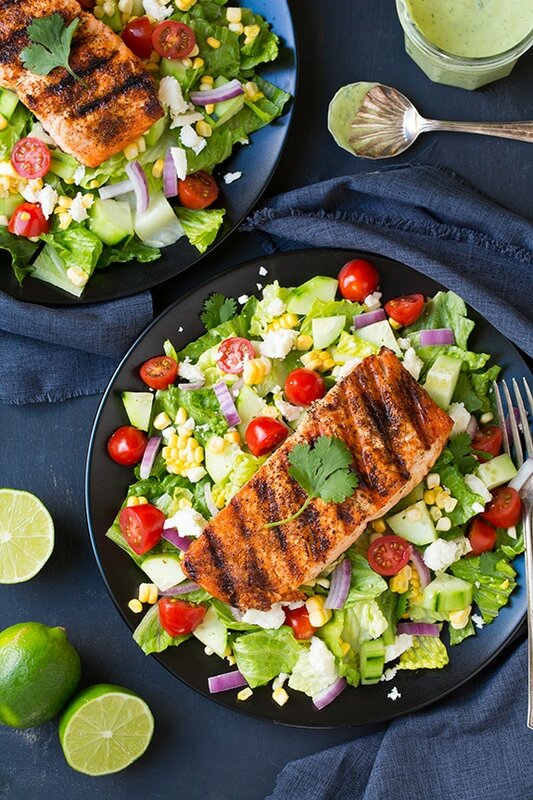 A healthy flavorful salad made with tender grilled salmon fillets, lots fresh vegetables and a creamy homemade avocado ranch dressing. Preheat a grill over medium-high heat. In a small bowl whisk together chili powder, cumin, paprika and onion powder. Brush both sides of salmon with olive oil then season both sides with salt and pepper then sprinkle spice mixture evenly over both sides of each fillet. Dip a paper towel in olive oil then using long handled tongs, brush grill with olive oil. Add salmon to grill and cook about 3 minutes per side, or to desired doneness. Remove from grill and squeeze fresh lime juice over tops. 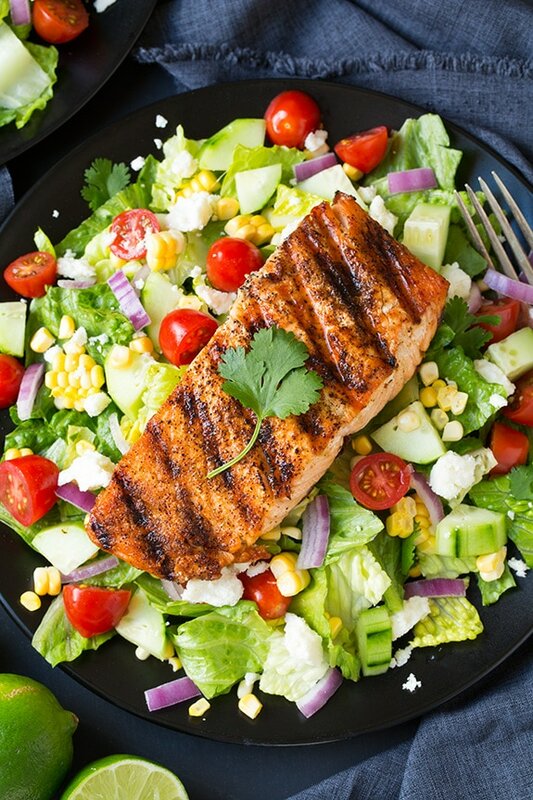 Divide all salad ingredients among 4 plates then top with salmon fillets. 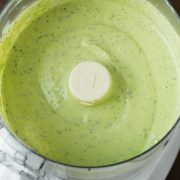 Spoon dressing over salad or pour dressing into a resealable bag, seal bag and cut one corner and drizzle over salads. Serve immediately. Avocado Greek Yogurt Ranch recipe HERE.